The Christy Banquet Centers and Catering are proud to announce we have received two outstanding awards this year acknowledging our reputation as one of the highest-rated wedding professionals in the St. Louis area. It is an honor for The Christy to be recognized for putting our clients first and helping create the wedding of your dreams! This is the eighth year The Christy Banquet Centers & Catering have been selected for The Knot Best of Weddings. We are also proud to announce that we have been selected to The Knots Best of Weddings Hall of Fame! This honor is bestowed on Exceptional vendors who have earned four or more of The Knot Best of Weddings awards. 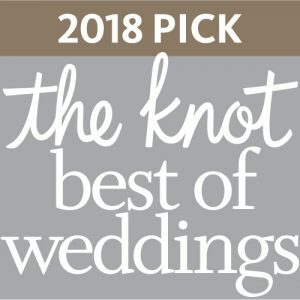 We have been selected as a 2018 winner in The Knot Best of Weddings! This year, marks the 4rd year in a row that we have made the Best of list! This year, 8,526 local wedding professionals out of the approximately 300,000 on The Knot received the distinguished accolade of The Knot Best of Weddings award. To determine the winners, The Knot assessed almost one million reviews from real couples across the various vendor categories—venues, musicians, florists, photographers, caterers and more. The result? The Christy Banquet Centers and Catering came out on top! This is the sixth year we have been selected for The Knot Best of Weddings. We’d love to be a part of your own unique wedding day, visit our Storefront on The Knot.com and get in touch! We have also been named a winner of the prestigious WeddingWire Couple’s Choice Award 2018 for the fourth consecutive time in a row. The award distinguishes the top five percent of wedding professionals in the WeddingWire Network who demonstrate excellence in quality, service, responsiveness and professionalism, based on their professional achievements from the previous year. Check out our Storefront on WeddingWire to find out how we can make your special day memorable and stress-free! We would especially like to thank our past clients for taking the time to review The Christy Banquet Centers & Catering on WeddingWire and The Knot. We value all of our clients and truly appreciate the positive feedback that helped us earn these achievements!